In most divorce cases, the separating spouses want the proceedings to be over as soon as practically possible. They often attempt to cooperate with each other (and each other’s counsel) to resolve the major issues in an efficient manner. Conducting the proceeding in this way serves to benefit the parties by reducing costs and limiting any attendant emotional turmoil. Unfortunately, however, some cases drag on, often due to the “vexatious” approach of one of the parties. An experienced family law attorney would be able to address and hopefully minimize or completely deter such conduct. If you are considering a separation or divorce, it is important that you contact a local San Diego family lawyer as early in the proceedings as possible. The California Family Code offers some recourse to parties who are up against a vexatious litigant. For instance, section 271 authorizes a court “to base an award of attorney fees and costs on the extent to which the conduct of each party or attorney furthers or frustrates the policy of the law to promote settlement of litigation and, where possible, to reduce the cost of litigation by encouraging cooperation between the parties and attorneys.” In a recent divorce case, the court of appeals reviewed a trial court’s order requiring an ex-wife to pay her ex-husband and his second wife a combined amount of costs and fees under section 2030 and section 271 of the Family Code, without distinguishing between the two provisions. Section 2030 requires courts to ensure that both parties to a divorce case have equal access to legal representation. It is a provision that enables a court to order, based on the income and needs of the parties, one party to pay the other’s attorney fees and costs of maintaining or defending the proceedings. Here, the couple dissolved their marriage in 2002 but had engaged in lengthy litigation proceedings regarding child custody and support for a number of years. The most recent action concerned the ex-husband’s 2008 motion for a modification of child support, attorney fees, and sanctions, his 2010 application seeking a change in child custody, and the ex-wife’s 2012 application for a modification of child support. At the conclusion of the June 2013 trial, the court issued the award referenced above. The court’s findings included observations that the ex-wife and her counsel engaged in “overzealous litigation” and that, although the underlying case was not complicated, it was made such by a “complete abandonment” of the litigation process. Furthermore, the court pointed out that the ex-wife’s father paid her attorney fees, causing her to have no regard for the amount of those costs. The ex-wife characterized these payments as a “loan against her inheritance.” The ex-husband and his second wife were not in the same financial position and were unable to finance the litigation on the same level as the ex-wife. The ex-wife appealed, arguing that the court erred by issuing an award under two separate statutes, without any distinction, and by including her father’s payment of legal fees in calculating the parties’ relative circumstances under section 2030. The court of appeals disagreed and affirmed the trial court’s findings. First, it concluded that the court did not err by combining cost shifting with sanctions. Second, the court determined that the lower court properly considered the funds that the ex-wife’s father paid to the attorneys in determining the parties’ relative circumstances. Under California case law, when a party receives recurring gifts of money, the court has discretion to consider that money as income, even if it is characterized as a loan. Here, the court looked at the economic reality of the situation and ruled against the ex-wife. It is important to understand how these family code provisions can affect your financial rights in a divorce case. 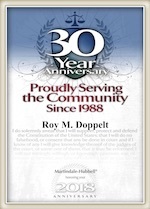 For more than 20 years, Roy M. Doppelt has been representing parties in divorce matters in Southern California. Doppelt and Forney, APLC serves clients in Linda Vista, Encinitas, Scripps Ranch, San Diego, and throughout Southern California. For a free consultation with a dedicated and experienced family lawyer, contact Doppelt and Forney, APLC through the law firm’s website or give us a call toll-free at (800) ROY IS IT (769-4748).